The best way to listen to GrowthtracRadio on your favorite device is with our App. Available for Apple and Android devices. If you don't want to download the GrowthtracRadio App, you can still listen live now. We’re obsessed with our Worship Music Mix! GrowthtracRadio is Radio for Your Marriage. You won’t hear standard artist singles, repeating the same songs every hour. What you will hear is a Top-40 sound, but deeper and more energetic, a fresh variety of live worship and independent artists — mixed in with the Top 10 and a few oldies. Plus — You’ll hear a variety of marriage topics presented by leading experts, with high-impact, relevant delivery. We hope we’ll be your Christian radio station! We think you’ll like the change. Talk to us! How is GrowthtracRadio making a difference in your marriage? Call 224-268-7556 and leave a Text or Voicemail. Or, click here if you’d rather send an email. Listen to GrowthtracRadio wherever you are — here on this page or on your mobile devices with our app. Enjoy the best Christian music mix and grow your marriage with radio programs from today's experts. Looking for our Mobile apps? View this page from your favorite mobile device. Download our iOS or Android app or Listen on the player here on growthtrac.com. Choose Internet Radio from the pop-up menu at the top left. If you don't see Internet Radio, choose Edit Menu, select Internet Radio, then click Done. Click the triangle next to the Religious category. 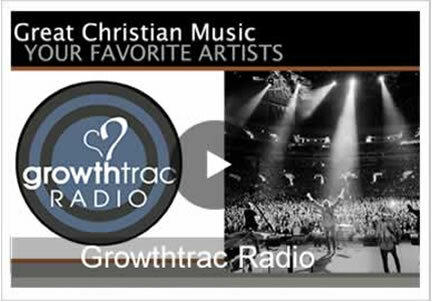 Scroll-down to and Click on Growthtrac Radio — To tune in, double-click. Don't see it? Search for GrowthtracRadio. Enter 'growthtrac' and you'll find our TuneIn station. Produced by Growthtrac Ministries, The Marriage Insight presents relevant tips from marriage experts in a fun, concise format. Inside the Music are lively relational snippets from Growthtrac's Christian artist interviews. Biblically-based resources that help prevent re-divorce, strengthen stepfamilies, and help break the generational cycle of divorce. Laugh Your Way to a Better Marriage with speaker, Mark Gungor, as he provides an up-lifting message to help build and strengthen marriages. Listen every Tuesday for the latest Christian music. If you are desperate for change in your own marriage or simply desire to take your marriage to the next level, we invite you to connect with marriage expert, Jimmy Evans. Hosted by Crown Financial Ministries CEO, Chuck Bentley and features in-depth discussion and fresh, relevant information on how to make and manage money while fulfilling God's purposes for your life. With renowned author, speaker and counselor Dr. Gary Chapman. In each 30-second program, Dennis Rainey heads to the street to get a cultural perspective on the issues that affect families today. He then provides a Biblical response and gives listeners a practical way to make their families strong. Featuring today's music artists, LifeChange Moments features powerful, poignant sound bites capable of guiding listeners to a better grasp of God's Word and Principles. From the popular TLN television program, with Dr. Bob Moeller.